What's better than drum corps on Father's Day? How about drum corps at a new, state-of-the-art facility close to downtown Chicago? The Sports Complex on the campus of Benedictine University in Lisle, Ill.
On Sunday, June 19, 2005, DCI comes to Benedictine University's Sports Complex in Lisle, Ill., for the first time. 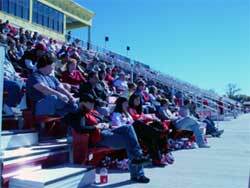 This venue will certainly provide an intimate and convenient drum corps experience for all who attend. Lisle, located 30 miles from the heart of Chicago, is the perfect centralized location for many Midwestern fans. Why not take in the sights of Chicago and make a weekend of it? Dad will surely love it! Tickets are now on sale online and at 800.495.7469 x 3.